There is normally only one free edition of Popular Information each week. But I wanted to send along this newsletter because of the dramatic developments in the North Carolina election fraud scandal. Popular Information has had a significant impact on this story. 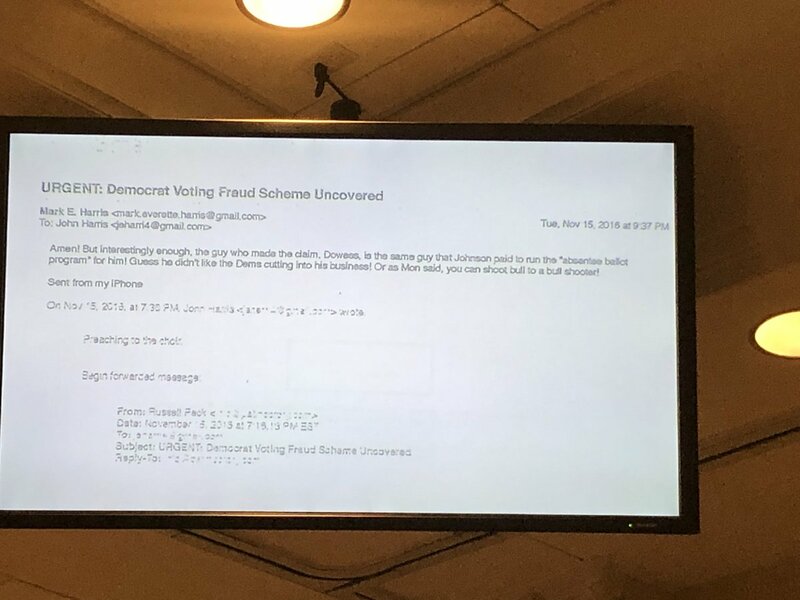 In December, Popular Information obtained and published the absentee ballot envelopes that exposed the participants and tactics of the Republican vote harvesting operation. You can support independent accountability journalism -- and receive Popular Information four times each week -- with a paid subscription. It's just $50 for an entire year. You can also subscribe monthly for $6. If there is something holding you back, let me know. You can reach me at judd@popular.info. We've known for weeks that operatives working in North Carolina for Republican Mark Harris committed systemic election fraud. There is overwhelming evidence that a man named Leslie McCrae Dowless ran an illegal operation to harvest and forge absentee ballots in North Carolina's 9th Congressional District. On Wednesday, Mark Harris' son John, an assistant US attorney, testified that he repeatedly warned his father about McCrae Dowless' tactics. In phone calls and emails, John Harris told his father that he believed McCrae Dowless was breaking the law and emphasized the legal and political risks of hiring McCrae Dowless for the 2018 campaign. Mark Harris ignored his son's warnings and hired McCrae Dowless anyway. Then, when McCrae Dowless' illegal activities were exposed, Mark Harris claimed to be taken completely by surprise. In the 2016 Republican primary, Mark Harris faced incumbent Congressman Robert Pittenger (R-NC) and fellow challenger Todd Johnson. Pittenger ended up narrowly defeating Harris and Johnson finished third. That evening, John Harris emailed his mother and father to flag that "Johnson got a significantly disproportionate share of an unusual number of absentee-by-mail votes" in Bladen County. John Harris said the discrepancy "may be worth investigating." Indeed, the results were stark. Johnson received 214 absentee-by-mail votes in Bladen County, Harris received four, and Pittenger received zero. John Harris told his dad that he was concerned someone was collecting ballots, which is illegal. Mark Harris told his son that night that someone was running Johnson's absentee ballot operation. The person was McCrae Dowless. In 2016, McCrae Dowless filed a complaint alleging that Democrats were committing voter fraud. In an email to his son sent November 15, 2016, Mark Harris noted that McCrae Dowless "is the same guy that Johnson paid to run the 'absentee ballot program' for him." "Guess he didn't like the Dems cutting into his business!" Mark Harris quipped. Mark Harris' "joke" suggests that, as of November 2016, Mark Harris was well aware that McCrae Dowless was a fraudster. In 2017, Mark Harris met with McCrae Dowless about potentially running an absentee ballot operation for his campaign. The next day, Mark Harris spoke with his son. John Harris reminded his father that he thought McCrae Dowless broke the law during Johnson's 2016 campaign. He believed McCrae Dowless was harvesting ballots, which is illegal in North Carolina. Mark Harris said that he believed McCrae Dowless' operation was legal. After the phone call, John Harris emailed his father. 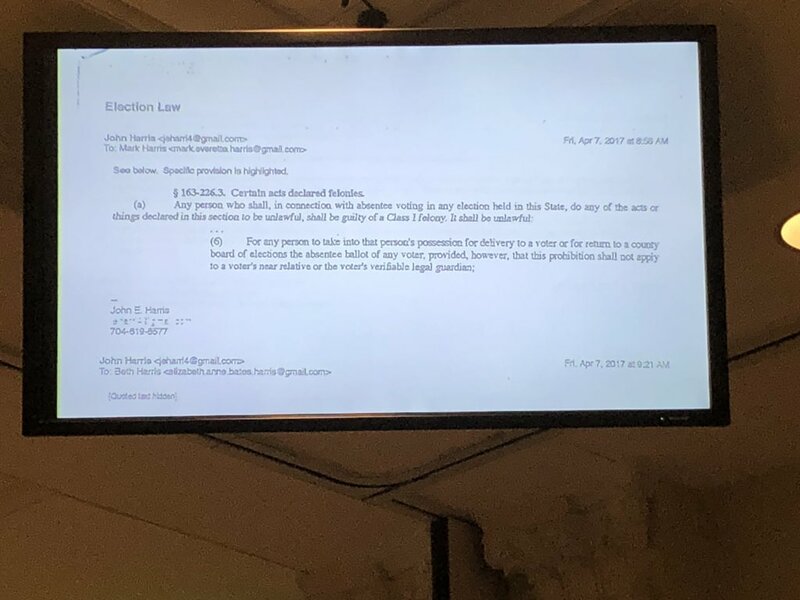 "The key thing that I am fairly certain they do that is illegal is that they collect the completed absentee ballots and mail them all at once," John Harris wrote. He included a copy of the criminal statute. Mark Harris was brainstorming scenarios in which McCrae Dowless might not be breaking law. In an email to his son, Mark Harris said, "Mom brought up a good point… maybe they just go with the person to their personal mailbox and put it in and raise the red flag for the mailman to pick up." In another email, John Harris asked his father to consider whether he'd be "comfortable with the full process [McCrae Dowless] uses being broadcast on the news." John Harris also wrote that, based on the irregularities associated with McCrae Dowless' work in 2016, he should be prepared for negative publicity and a possible criminal investigation. "I raised red flags at the time the decision was made to hire Mr. Dowless," John Harris said. John Harris said that, despite these warnings, his impression is that his father had already made up his mind to hire McCrae Dowless "because he had a demonstrated record of success." John Harris said that he thought McCrae Dowless was breaking the law "and I was right." John Harris testified that he warned his father multiple times about McCrae Dowless and the risks in bringing him on board his campaign. But in an interview last month, Mark Harris said he had "no reason" to think McCrae Dowless was involved in anything untoward. You know I guess you could say I almost took on a pastorly role to McCrae Dowless. I found him to be a very enjoyable man who I chatted with, and again, everyone that I had talked to seemed to respect him and seemed to love him. I had no reason to think otherwise. Mark Harris was asked in the interview why he didn't become suspicious of McCrae Dowless' tactics in the 2018 primary. In that race, Harris collected 437 absentee mail votes in Bladen County to Pittenger's 12. "[W]hy would I expect that success was a bad thing?” Harris said. In another January interview, Harris said that he never heard "one red flag" about McCrae Dowless. Q: You never heard one red flag [about McCrae Dowless]? Q: But at all. Ever. HARRIS: No. Except, I would later learn that obviously there had been things in the past that had been looked into. But everything that had been looked into -- everything had come out just perfectly fine. Harris said all the people he talked to spoke "very highly" of McCrae Dowless. He said that when he learned about McCrae Dowless' activities in December 2018, he was "infuriated." On December 3, 2018, after a federal investigation into the Harris campaign was launched, John Harris emailed his parents and said they needed to cut off contact until the investigation was over since he works for the Department of Justice. On Dec. 3, John Harris sent his parents an email and said that since he's a DOJ party, it would be best if they didn't talk until this whole #NC09 investigation was over. John Harris also probably realized, based on what he knew about McCrae Dowless, that he might eventually be required to testify about what he knew. Speaking with his father could have been interpreted as an effort to obstruct the investigation. John Harris discovered the emails with his father about McCrae Dowless by searching his own account in December. His father's attorney had told him that the campaign would provide the emails to investigators. In late January, John Harris learned that never happened, so he turned the emails over to investigators himself. 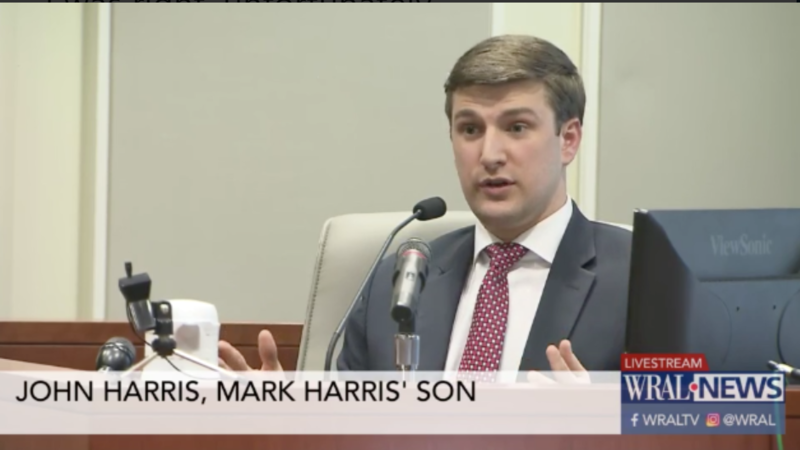 According to Mark Harris' attorney, he didn't know his son would testify today. John Harris grasped the significance of his testimony. "I love my dad, and I love my mom, OK? I certainly have no vendetta against them, no family scores to settle. I think that they made mistakes in this process," John Harris said at the end of his testimony. Mark Harris, listening from the audience, cried. Mark Harris will testify next. McCrae Dowless refused to testify, saying he would need criminal immunity before he answered questions. The hearing was supposed to conclude this week, but may end up taking longer. Whenever it ends, the North Carolina State Election Board will either certify Harris as the winner or order a new election. Under a law passed late last year, if the Board orders a new general election there will also be a new primary. There are three Democrats and two Republicans on the Election Board. Four votes are required to certify Harris or order a new election. If the Board deadlocks, the issue would likely be solved by the House of Representatives, which could also order a new election.